An airplane was being towed to a gate at SFO on Wednesday when the right wingtip made contact with a concrete post, officials say. 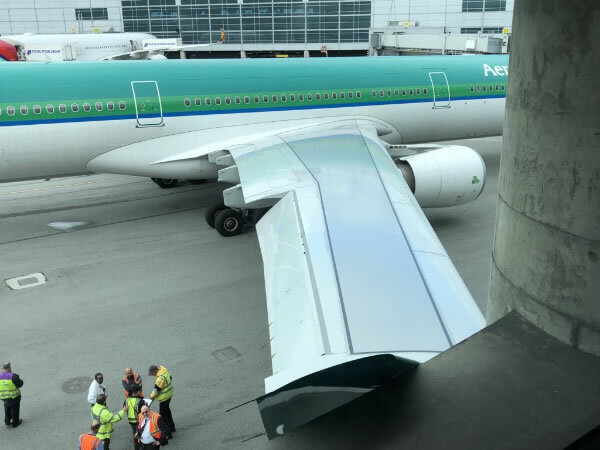 SAN FRANCISCO INTERNATIONAL AIRPORT (KGO) -- Passengers on an Aer Lingus flight experienced a bit of a bumpy ride after already landing at SFO. The plane's wing clipped a concrete column. It happened as Flight 147 from Dublin was being towed to its arrival gate at SFO. The tractor operator apparently misjudged the distance resulting in some damage to the tip of the plane's right wing. No one was injured, but a few passengers vented on Twitter. Janelle tweeted, "Everyone is okay but we were so close to leaving the plane! Can't wait to get off." The Airbus 330 was supposed to fly back to Dublin a couple hours later, but that flight was delayed. Aer Lingus pushed back the time to allow crews to do some repairs. The work took longer than expected, delaying the scheduled departure a few more times as the evening went on. "I'm trusting that there are processes and the engineers will not let us fly if there's anything actually wrong with the plane," said Aer Lingus passenger Christina O'Reilly who is heading to Ireland to visit family. "So really I mean I'll just be grateful if I make it there in one piece."